Home Expenses What are Outstanding Expenses? Outstanding expenses are those expenses which have been incurred during the current accounting period and are due to be paid, however, the payment is not made. Such an item is to be treated as a payable for the business. Examples – Outstanding salary, outstanding rent, outstanding subscription, outstanding wages, etc. Outstanding expenses are recorded in books of finance at the end of an accounting period to show the true numbers of a business. 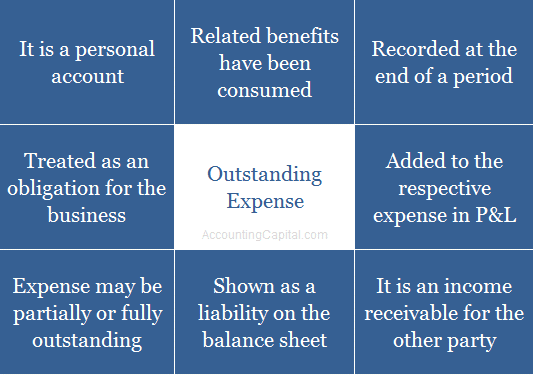 The outstanding expense is a personal account and is treated as a liability for the business. It is also shown on the liability side of a balance sheet. If O/S Expenses already appear inside the trial balance then it implies that the adjusting entry has already been passed. In this case, it is only shown in the balance sheet as a “current liability” and no adjustment is required in the income statement. Company-A has a rent obligation of 10,000/month that is paid on every 10th, the company has paid for 11 months and one month is unpaid until the end of the period. The amount for 1 month which remains unpaid is termed as “outstanding expense” for the company. At the end of the period this “expense due to but not paid” would impact the financials of the business and is supposed to be accounted for. Expenses are the amounts paid for goods or services purchased. According to the accrual concept of accounting, transactions are recorded in the books of accounts at the time of their occurrence and not when the actual cash/bank is received or paid. Payments are not necessarily made and received immediately, they may be late or in advance. Outstanding expenses, prepaid expenses, accrued income & income received in advance are all a result of delayed payments/receipts.